HOW DO CICADAS CAUSE PROBLEMS? 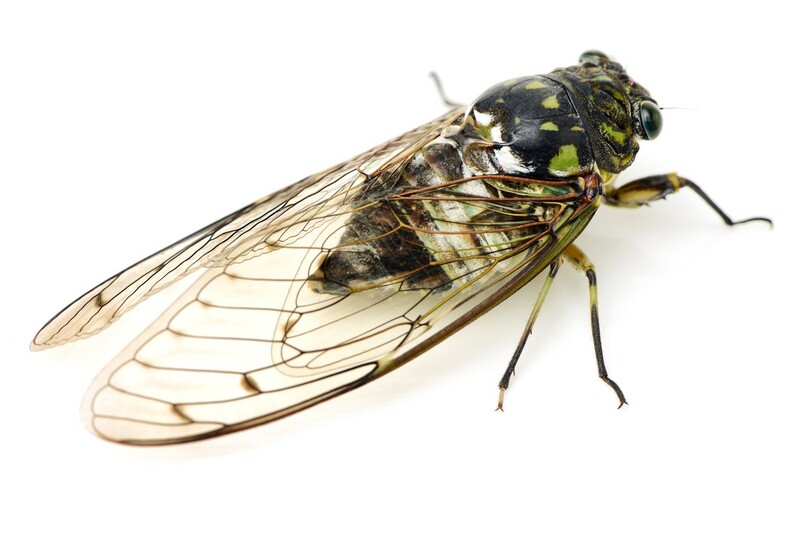 Cicadas are large insects that appear in late spring/early summer and make a lot of noise. Known around the world for being on a “17 year cycle”, many people believe they’re a sign of the “end times”. In fact cicada’s will emerge most every year. For this reason they’re commonly seen in large numbers and when active, their song will be heard all over the United States as summer arrives. 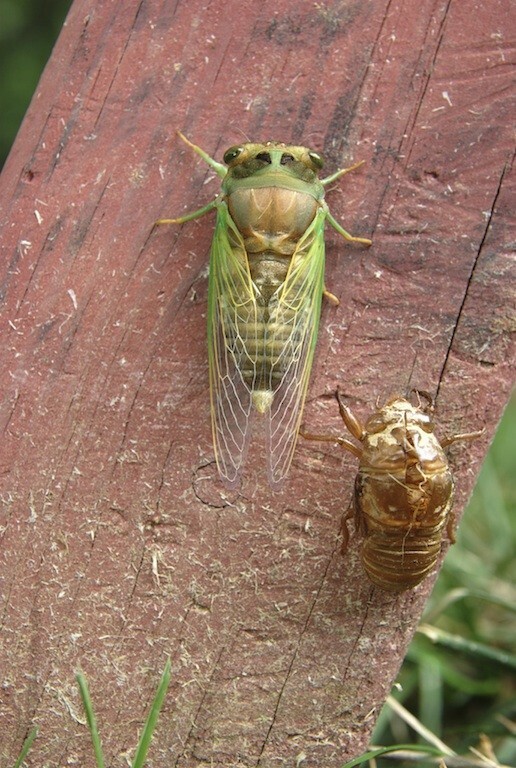 Cicadas can fly and will commonly infest residential neighborhoods. Even though they don’t sting, most people are afraid of them. Their large size seems to scare people and when one is seen, it usually gets a lot a attention. Cicadas are not attractive. They have an almost alien look with bulging eyes and a hard, shell like skin. Large and long clear wings don’t hide their short, stubby body. These insects are only active for a few months each year but when present, you know they are here!!! Cicadas are 2 1/2″ to 3″ long and easy to see. When active, they will fly from tree to tree in search of a mate and food. 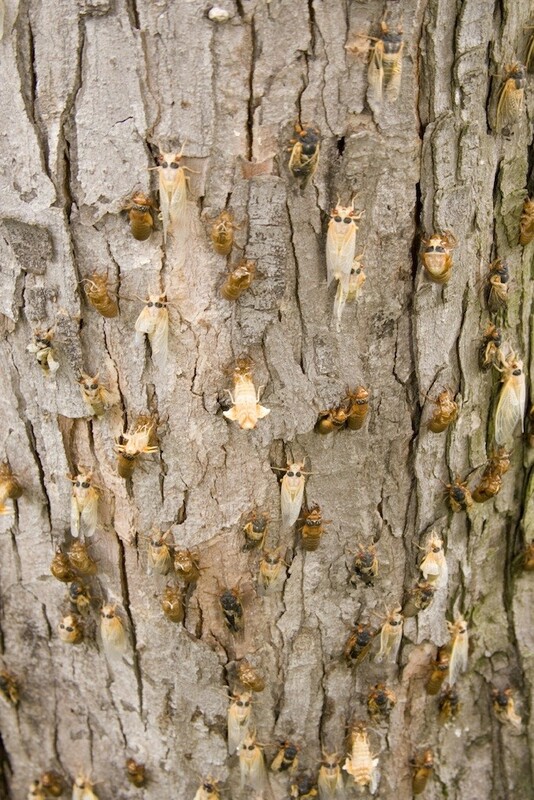 Adult cicadas eat mostly sap. Once females have mated and want to lay eggs, they seek small branches of trees and shrubs for egg laying. The plants targeted will become food for their young. Cicadas will commonly fly from tree to tree, living their complete adulthood in just a few months. 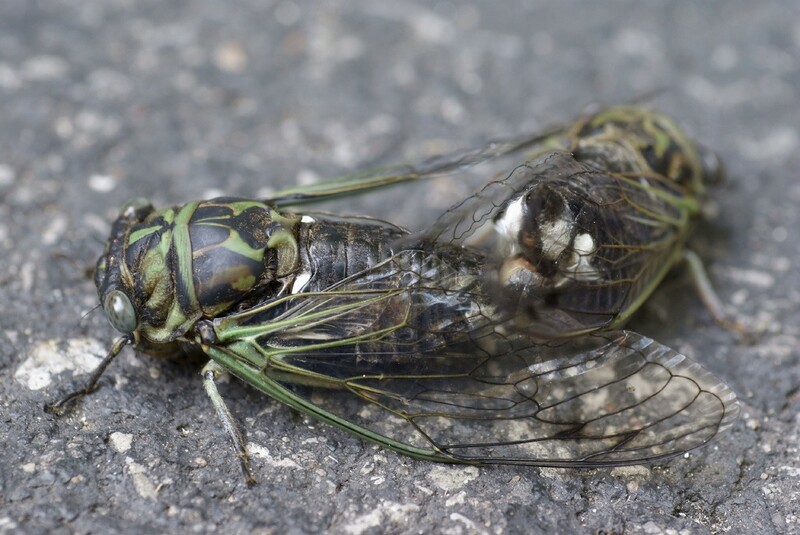 When they are spent and die off in late summer, adult cicadas will be seen on the ground being preyed upon by birds and other insects. This video shows what they look like up close. Cicadas are grouped into two main species; Dog Day and Periodical. Dog Day Cicadas are mostly green and black. There are many sub species of Dog Day Cicadas throughout the United States. These are the more common of the two species and appear annually throughout the country. These fully mature in 2-5 years and at least 15 sub species have been identified. Periodic Cicadas are mostly black with red eyes. There are at least 5 sub species of Periodic Cicada and they don’t seem to be as active from year to year as the Dog Day Cicada. 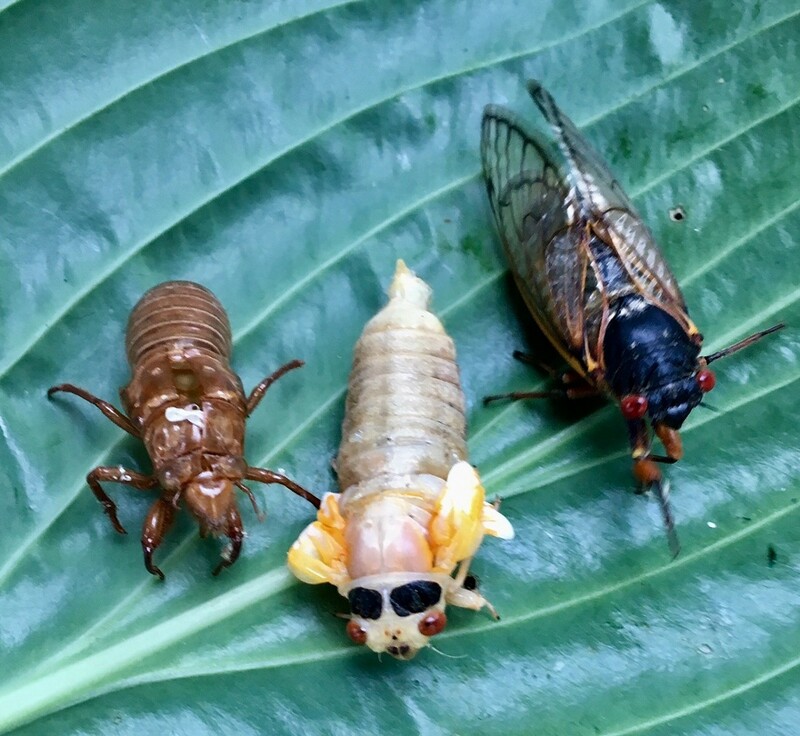 Periodic Cicadas take much longer to fully develop; southern species seem to be on a 13 year cycle while northern species seem to take about 17 years to complete their life. The exact range of either species is not known but clearly the eastern half of the Unites States seems to have the bulk of the populations. Both species make noise. This noise is a loud mating call that will be sung over and over again as summer starts. Male cicadas have large tracheal air sacs in their abdomen and thorax which is used to push air through vibrating organs located on their sides. These sounds will start virtually every morning and continue through most of the day. 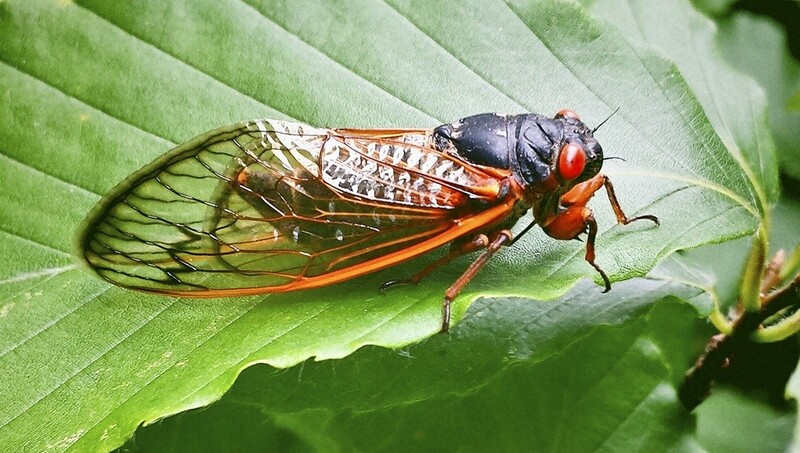 Though annoying, the sounds of cicadas are not damaging. However, their egg laying and larval development can stress and injure many types of trees and shrubs. Female cicadas will lay 500 or more eggs once gravid. These eggs are deposited through a needle like injector, called an ovipositor, and 10 to 20 eggs are sent into likely host trees when she makes her injections. Females will choose small branches and twigs for making egg deposits. Though large hardwoods and other mature, healthy trees probably won’t be hurt by this activity, young plants can suffer. Since the females will inject through several locations once they find a suitable limb or branch, these same branches will probably die in a few months due to the excessive punctures. Eggs will hatch in 1-2 months and larva will emerge falling to the soil. There they will burrow and feed on the fine shallow root system of the host tree or shrub. As they grow, the larva will move deeper and deeper into the ground where they will stay till fully mature. Regardless of the species, young cicadas will feed on the sap of the host tree and molt through their “instars” or stages of development. As they reach maturity, they will crawl out of the ground and up the trunk of the host tree. From there they will emerge from their last instar as an adult and fly off to mate and start the cycle again. They leave a brown “skin shed” on trees and shrubs which will remain for some time if undisturbed. This brown skin was their shell and can be useful at identifying just which trees and shrubs cicadas are targeting. This clue can prove to help identifying stressed trees as well as alerting you to the species of tree which is being targeted. Once this information is known, you will be better prepared for both controlling local populations as well as protecting similar or neighboring trees so they too don’t get infested and damaged. 1) The sound they make. 2) The damage they do to trees and shrubs. There are many treatment options available for keeping them and for killing existing populations. First, determine what it is you are trying to accomplish regarding your local problem. Next, choose one of the treatment options listed below for the type of problem you want to treat. 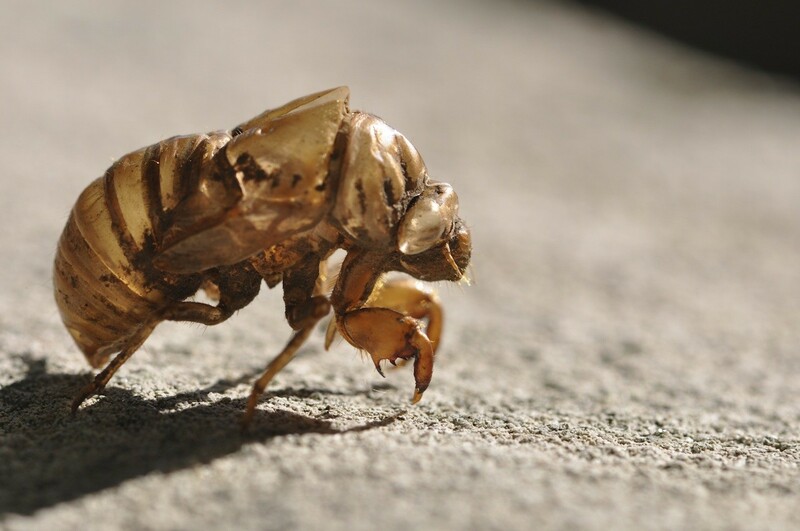 If you have cicadas active on your property or expect them to be emerging this spring/summer, there are several treatments available to both kill and repel all activity. The choice should be based on the size and type of plant you want to treat. Liquid applications will prove the easiest to employ; dusting will provide better control though not practical for large trees or shrubs. The strongest treatment is a combination of BIFEN XTS and SPREADER STICKER. This treatment will kill cicadas as well as repel them and can be applied throughout the landscape. Treat before cicada’s emerge which will be early to mid May for most of the east coast. 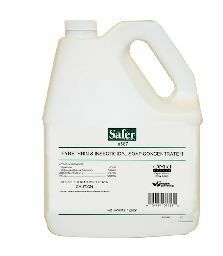 Use 1-2 oz of Bifen per 5,000 sq/ft of foliage or turf. Add 1 oz of SPREADER STICKER for every 1 oz of Bifen. 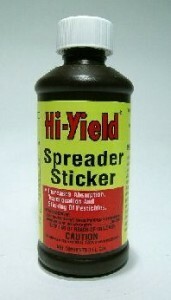 Spreader sticker enables the mixed solution to “spread” over the foliage. The net effect is a more thorough application and better results. 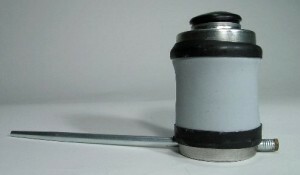 Though you can use a standard PUMP SPRAYER to apply the mixture, its generally best to use a HOSE END SPRAYER. Using the sprayer below, you would add 1-2 oz of Bifen and 1-2 oz of Spreader Sticker and then some water filling it up to the 5 gallon line. This would enable you to spray the contained Bifen and Spreader Sticker with approximately 5 gallons of water. The 1 oz rate is usually good for prevention but if things get bad, use 2 oz per 5 gallons. Once applied, the Bifen will both kill and repel cicadas. Its odorless, won’t hurt any plants and will provide 2-4 weeks of residual. But if the local population is large, expect to treat 1-2 a week during the peak activity. This could go on for 2-4 weeks so be prepared to defend all plants and shrubs you want to keep protected. Though male cicadas will land on just about any plant, females ready to lay eggs tend to target plants which will be best suited to become a food supply for hatching young. By treating these plants before the females start egg laying, you will be able to keep cicadas away and avoid tree damage. Treating as many of your plants will also repel cicadas so they don’t forage on your property which in turn will lead to less noise. If adult cicadas are targeting your vegetable or fruit garden in search of sap, use VEGETABLES PLUS PERMETHRIN to treat plants you want to protect. Mix 2 oz per gallon of water and like the Bifen, expect to treat once every 1-3 weeks but if local pressure is extreme, treat more frequently. Use a good PUMP SPRAYER to apply the mixture and like the Bifen, you’ll want to add 1 oz of the SPREADER STICKER to the tank mix as well. Keep in mind Permethrin won’t last as long as the Bifen because it’s not as strong; treatments will last approximately 1-3 weeks. But because it’s odorless and safe enough to use on any plant, its not a bad option. Now if you don’t have a sprayer or you have a large garden to treat, the CYONARA RTS would be better suited for your needs. 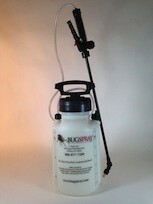 It too is a sprayable concentrate but it comes in a handy “ready to spray” quart jug. Just hook it up to your garden hose, turn it on and your ready to go. 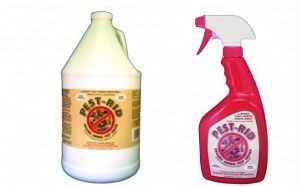 It’s odorless, very effective against cicadas and you get up to 15,000 sq/ft of coverage per quart so it goes a long way. Treatments should last 1-3 weeks but again, treat more frequently as needed during peak activity. For organic gardeners, protect plants with MULTIPURPOSE INSECT KILLER which is approved for use on organic gardens. Mix 6 oz per gallon of water and look to get 1-2 weeks of residual. The good news is you can spray this active daily if needed. 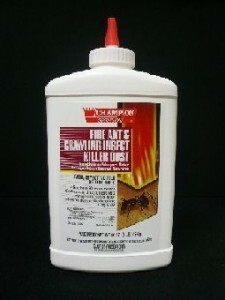 Multipurpose Insect Killer can be sprayed over any plant and will both kill and repel unwanted cicadas. Cicadas can also be repelled by a liquid spray called PEST RID. This treatment will not kill cicadas but instead, chase them away. Typical use might be on a specific tree or plant you want to protect. Or you may want to spray your deck or patio to make sure they don’t annoy you when outside in the immediate area. Treatments with Pest Rid will last 2-3 weeks and can be renewed as frequently as needed. 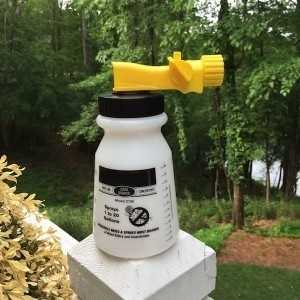 The small size comes with it’s own spray bottle and will cover up to 125 sq/ft; the gallon jugs can be applied with any standard PUMP SPRAYER. and will cover up to 500 sq/ft. Pest Rid is “ready to spray” so no mixing is required. If you get the gallon size, you’ll need a good PUMP SPRAYER to make the application. Another treatment to keep cicadas off plants is to dust instead of using a liquid. Dusts will last at least as long and even longer in arid or dry areas. DELTAMETHRIN DUST can be applied to just about any plant and will yield 1-2 months of residual as long as it doesn’t get a heavy soaking from irrigation or rain. For a just a few plants, you’ll need a HAND DUSTER to apply the dust. For treating a lot of plants, get the DUSTIN MIZER. For anyone who wants a “quick kill” option, go with our HORNET KILLER. Its not a practical way to control cicadas but it does work. And for anyone afraid of them, you may want to keep a can around for use as needed. It can reach up to 15 feet and is good for use around the home and yard. Just don’t use it inside; it will make a mess! Another way to protect local trees and shrubs is by using a systemic. These are products that are watered into the ground around your plants. Once in the ground deep enough, the plants root system will absorb the active and distribute it throughout the plants limbs and leaves. 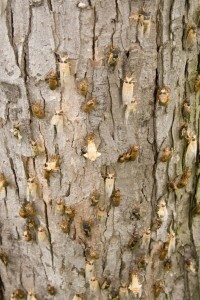 Insects which target the plant to feed on sap will ultimately ingest some of the active and die. Systemics are highly effective once distributed and since treatments can last a year, a good way to reduce plant loss – especially when the target pest is living underground out of site. The only drawback with systemics is that they won’t affect adult cicadas which have already fed. Additionally, they take a good 30-60 days to distribute throughout the plant so it’s important to get applications done in the spring and early summer ahead of the hatching larvae cicadas which arrive late in the year. 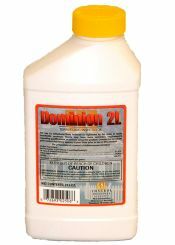 The best systemic for any insect is DOMINION 2L 21.4%. Commonly used for termites, aphids, whiteflies and many other pests, Dominion is easy to use and cost effective. Its highly recommended to use this on any plant, tree or shrub you want to protect. As a general spray for foliage and tree bark, use .5 oz per gallon of water. 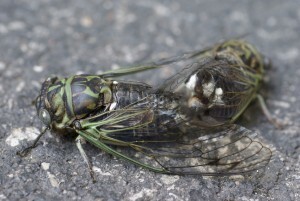 Foraging cicadas will walk over the non-repellent spray, pick up a lethal dose and die in a few days. But the best way to use Dominion is to mix .1 to .2 oz per 1 inch of tree diameter. To get a good estimate of your trees diameter, measure the circumference 4.5 up and then divide this value by 3. The circumference is like taking your waist measurement; you’ll have to wrap a tape measure around the tree and you’ll want to do this 4.5 feet up from the top soil. So if you measure the circumference to be 36″, you’d then divide this value by 3 to get its diameter of 12″. Once you know that value, you’d know to use 1.2 to 2.4 oz of chemical in 3-5 oz of water applied inside the trees drip line by soil drenching. Cicadas are a sure sign summer has arrived. Their mating call will be heard throughout the day and will be loud enough to keep you from sleeping late. More importantly, females can damage host trees with their egg laying. Their piercing ovipositor can cause host plants to loose valuable sap and other fluids. Treat susceptible plants to keep cicadas away. For plants which are showing signs of hosting cicada larva, apply some granules around their base. These granules will kill hatching larva as they fall to the ground and try to borrow beneath the surface in search of plant roots. Intercepting the larva before they get established will help keep your plants healthy and happy. Keep some Hornet Freeze close by for any cicadas you want to kill off quickly. Though adult cicadas are only around for a few months during the summer, cicada larva will be feeding on host plants for several years. Don’t give them a chance to get established; treat local plants to help keep local populations in check. They are on their way to this area and this information will be helpful to help not drive me crazy and how to cut down their numbers. Our trees are looking like they are dying. There are so so many. Can we get the county to come and spray our street? Will the bug spray hurt other plants or pets? In general, there are no government agencies spraying for cicadas at this time. And since none of the products we have listed above will pose a hazard to people or pets when used properly, you can definitely start doing some treating to reduce the local population and save your trees without putting pets or people at risk. So if want to start reducing the damage foraging cicadas will do, you’ll need to start by spraying live adults with the Cyonara RTS listed above. Next, apply Dominion 2L to the soil around any tree or other plant you want to protect. Dominion is a systemic that will permeate throughout the plants foliage, roots, bark, etc. so that any insect which tries to eat the tree or plant will die.